So you want to plan a wedding that won't damage the environment? Often, people want their special day to be as eco-friendly as possible, but are worried about how much more it will cost. There is a perception that planning a green wedding means a lot more work and a lot more money. The good news is that while this may have been the case in the past, it definitely isn’t today. Many wedding companies are fully aware that more and more couples want to plan their perfect day in an environmentally friendly manner - and there are now even green-wedding specialists. If you are organising the big day yourself, there are many ways to cut costs and help the environment at the same time. This means you can still have your perfect white wedding but make it as ‘green’ as possible. Here are some simple tips and ideas for an eco-friendly day – and remember that a few small changes can make a very big difference to the environment! One great way to cut down on carbon emissions is to hold the ceremony and reception in the same venue. This cuts the cost of hiring transport such as wedding cars and reduces fuel emissions since your guests won’t have to travel between venues. If you want a church wedding which can’t accommodate your reception – then choose a reception venue which is close to the church. When checking out venues, ask whether they use locally sourced and organic food. 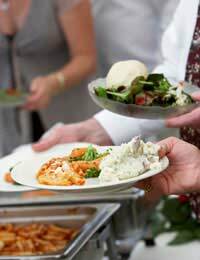 If you choose a cold buffet rather than a hot meal, this will also cut down on the energy used. You can use biodegradable seed-paper or other alternatives such as hemp, banana-stalk and bamboo. You could even use email invitations. This may not suit everyone, but in one fell swoop you will save on paper, postage and fuel in delivery. One of the most important items for your big day is the wedding gown itself. Fortunately, many bridal designers are taking heed of the increasing demand for eco-friendly outfits – for both bride and groom.Some companies use environmentally friendly materials and products or, if you are planning to hire rather than buy the outfits, check whether the supplier uses eco-friendly dry cleaning. A popular idea for bridesmaids’ dresses is to buy second-hand and you can buy jewellery, tiaras or other hair accessories from manufacturers who recycle vintage pieces to create fantastic modern pieces. As far as THE dress is concerned, if you plan to buy you can choose a vintage or pre-owned wedding dress, which will be significantly cheaper. Many bridal shops specialise in pre-owned dresses – or you can buy from charity or an auction site. If you are buying, then consider donating your wedding dress to charity after the big event. Charities such as the Making Memories Breast Cancer Foundation donate all proceeds from donated wedding dresses to improving the lives of cancer patients. This way, you know that your gown has gone towards a really good cause and it saves it from gathering dust in the loft! A good ‘green’ wedding idea is to ask your guests to pick out live presents, like planting a tree or buying seeds. This can be good if you already live together and don’t really need the traditional toaster or set of pans. You can also ask for gifts from antique/vintage shops – and even charity outlets. Of course you don’t want to end up with gifts that you won’t like so it’s best to specify actual items that you’ve seen. If you are buying diamonds, then make sure they are conflict-free. This is fairly easy to check and there are also jewellers who make wedding rings from recycled gold. Choose hybrid or electric transport - or even a horse and carriage – for your big day and buy local seasonal flowers for the bouquets. You should also check out auction sites like Ebay for eco-friendly confetti and wedding bubbles. Finally, you can have a green honeymoon by staying in the UK – and that will also cut down on costs!